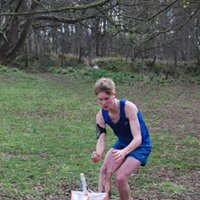 Rossmore report Fingal’s Leinster League event at Rossmore forest park in Monaghan on Sunday attracted a good field, with an interesting forest, plenty of route choice to keep us on our toes, and our last chance of a forest run before the Leinster Championships. A heady mix of aromas (wild garlic in the forest and pig slurry from the surrounding fields) added to the atmosphere and we had a few top-ten placings: Valdas Tilunas 2nd on the 9.2 km Brown course; Aidan McCullough 3rd and John 7th on Blue; Mary O’Connell 9th on Green; Nora Lee 9th on Light Green. Great to see our M85 Con Carroll making the trip north as well. Thanks to Eileen Young for planning and to Fingal Orienteers for putting on the event. Results are here. O-training next Saturday: David Healy (GEN) is putting on a small training event at Massy’s Estate, beside the Hellfire Woods, from 11 to 1 on Saturday. The emphasis will be on compass and pacing (distance judgement). All welcome, but e-mail gen@orienteering.ie if you’re coming so Dave knows how many and who to expect. See the location here. 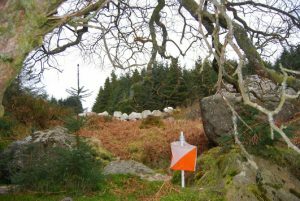 Mountain Running: Saturday also saw several orienteers doing very well at the IMRA Maurice Mullins 25.5 km race from Ballinastoe to Glencullen: 3ROC’s Colm Moran was 7th; Mark Stephens (LVO) was 2nd, Ruairi Long (UCDO/Ajax) 4th. There were about 200 runners, with a further 230 or so running the “full” race of 51 km from Johnny Fox’s to Ballinastoe and back, along the Wicklow Way. 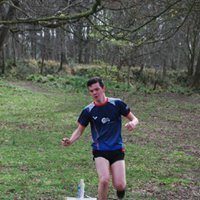 Maybe we should be making orienteering more demanding if it attracts these numbers … Elsewhere Eoin McCullough finished 9th in a 10k road race in Montreal on Saturday, on a course where they had to clear away the snow for the race. Leinster Championships entries have closed and the event details are here. There will be two entry on the day available (Yellow and Light Green standard) but not Championship courses. AGM reminder: The 3ROC AGM is on Friday 5th April at the Dropping Well in Milltown, Dublin 6 at 7.30. Finger food and a get-together after the actual meeting, so please come along! The annual training grants to our international 3Rockers will be presented at the AGM, amounting to around €1000 each year. See location map here. Pine Forest: Our next event is the Sunday after the Leinster Champs, at the Pine Forest, Rockbrook, on 14th April. Colm Moran is planning a middle-distance event, so it should be lots of fun! This is the Sunday between the Leinsters and the Jan Kjellstrom. Volunteers and needed to help: please contact the club if you can help (there’s a contact form on the top right of the page). More details later. Running training: There’s running training on Monday and Thursday evenings at UCD and nearby. Details from Lindie Naughton. 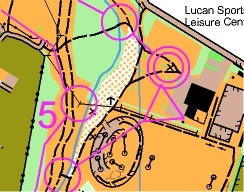 St Catherine’s Park: After the Pine Forest, the next 3ROC event is a come and try it introductory event at St Catherine’s Park, Lucan, for World Orienteering Day, on Sunday 19th May. More details later. Joining 3ROC or renewing your membership is easy: Just click here and you can sign up immediately on line. 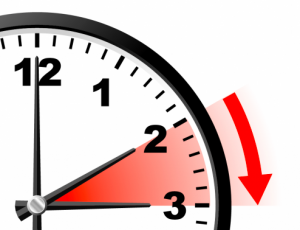 Spring Forward: Remember to put your clocks forward by an hour on Saturday night! Previous sprint map for Danish Spring. 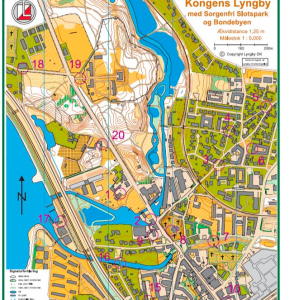 Good luck to Clodagh Moran and Mary O’Connell and the other Irish orienteers travelling to the Danish Spring competition this weekend – the Junior World Champs is in Denmark in July so this is perfect preparation.